When Ben Affleck’s Bruce Wayne looked up and watched Superman level a skyscraper in the trailer for Batman v Superman: Dawn of Justice, he saw “the power to wipe out the entire human race.” Upon this rubble, Warner Bros. executives will build their church: a shared superhero universe featuring all their most colorful characters, all centered on the premise that the Man of Steel has blood on his hands and is one bad day away from painting the whole planet red. Such is life in the action-blockbuster business, which in recent years has experienced a nerve-numbing elephantitis of stakes with little sense that anyone involved takes their extinction-level events the least bit seriously. From Megatron to Ultron, every day is like doomsday. In contemporary superhero comics, too, the apocalypse is a pretty common occurrence. This summer, both the Marvel and DC Universes have faced existence-ending conflagrations in the form of the Secret Wars and Convergence “event comics,” respectively. In these multi-series crossovers, prominent villains — Doctor Doom in the former, Brainiac in the latter — have reshaped creation in their own images and threatened all life in the process. The characters themselves can’t see it, what with all the blood-red skies and extradimensional menaces, but the end of their worlds, however temporary, serves a higher purpose. The meta-goal of both DC’s and Marvel’s story lines is to produce a new, streamlined continuity from the chaos and complexity of the old by concocting an end-times scenario as a smokescreen. Fans, the thinking goes, will have an easier time buying a new face behind Spider-Man’s mask if it arrived as a result of some sprawling Götterdämmerung instead of, or in addition to, editorial fiat. Thus, these apocalyptic events double as in-story engines for relaunching comics and rebooting concepts. DC is especially fond of this technique, having tried it five times before: 1985’s Crisis on Infinite Earths, 1994’s Zero Hour, 2005’s Infinite Crisis, 2006’s 52, and 2011’s Flashpoint. But at both companies, armageddons are so thick on the ground that characters plucked from various alternate postapocalyptic futures are numerous enough to populate entire planets — the bespoke battle worlds designed by Dr. Doom and Brainiac on which Secret Wars and Convergence take place. From a Marvel Universe overrun by zombies to a DC Universe devastated by an insane Green Lantern, an eschatological Murphy’s Law applies: If anything can destroy the world, it will. For iconic heroes like Superman, Iron Man, Batman, Wolverine, and Wonder Woman, as well as the corporations that shepherd them, the apocalypse is a cyclical (or cynical, depending on your perspective) affair. It raises the emotional and physical stakes of the adventures but ultimately serves only to clear away dead wood in time for the next conflagration.1 Worlds live, worlds die, but the song remains the same. For the past 20 years, Mike Mignola has played a different tune entirely. When the cartoonist’s Hellboy: Seed of Destruction #1 debuted in 1994, it was riding the tail end of a wave of independent superhero titles that were then giving the Big Two publishers’ signature lines a run for their money. Hellboy was part of an imprint called Legend, a “creator-owned” line in which indy publisher Dark Horse enabled writers and artists chafing under the corporate yoke to create and control their own characters outright. Legend was founded by Batman: The Dark Knight Returns’s Frank Miller — whose hardboiled crime opus Sin City was among its biggest hits — along with Uncanny X-Men’s John Byrne. The lineup of talent they helped assemble was generally older, less flashy, and more technically accomplished than that of their likely inspiration, Image Comics, an upstart house founded by hot ex-Marvel superstars like Jim Lee, Todd McFarlane, and Rob Liefeld. While eschewing these young turks’ bloody, big-muscled extreme-’90s style, Hellboy shared their basic not-your-father’s-superheroes approach. The character’s initial arc, scripted by Byrne off a story by artist Mignola, set him up as a chain-smoking, trench-coat-wearing demon with a heart of gold who led an X-Files-style task force called the Bureau for Paranormal Research and Defense as they investigated, and inevitably battled, supernatural menaces to humanity. The book drew heavily from horror, and no one (aside from a Byrne-created Captain America knockoff called the Torch of Liberty, who, like Byrne himself, soon disappeared from the book) wore spandex. But refusing to use the superhero label for a comic in which a team of extraordinary individuals with spectacular powers — including fish-faced humanoid Abe Sapien and goth fire-starter Liz Sherman — solved problems through violence is not a semantic game worth playing. Mignola himself copped to his influences easily enough, describing Hellboy as a playground where the cosmic combat of Jack Kirby (cocreator of the majority of the Marvel Universe) could meet the cosmic horror of H.P. Lovecraft. Many of its early antagonists were World War II–era mad scientists straight out of the Red Skull playbook. It was a superhero story in shadowy drag. It just so happened to be an excellent superhero story, not least because Mignola drew it so damn well. Hellboy himself boasted one of the strongest new-character designs of the decade, from the distinctive circles of his sawed-off horns to the obvious appeal of the gigantic red right hand he used to wallop demons, vampires, and elder gods. Gill-necked Abe Sapien, choker-wearing redhead Liz Sherman, and Rasputin — pre-revolutionary Russia’s mad monk, reimagined as a nigh-immortal sorcerer and cast as the team’s nemesis — had visual signatures nearly as strong. Readers drawn to the artwork soon found themselves immersed in a dazzlingly dark adventure saga that turned disposable pulp tropes — haunted houses, brains in jars, Spielbergian Nazi occultists, evil gorillas — into something suggestive of unfathomable, Book of Revelation–level depth. Indeed, these initial stories centered on the revelation that Hellboy is, in fact, the Biblical Beast of the Apocalypse, destined to bring about the end of the world. He could right-hook his way out of trouble for the time being, but the truth was out there. After the turn of the millennium, Hellboy’s adventures became more and more far out (literally so: He spent several years off-panel, walking across the bottom of the ocean), and a series of multi-artist anthology titles set in his world filled the gap. Eventually, Mignola became consumed both by his own perfectionism and by the demands of the story’s cinematic adaptations by director Guillermo Del Toro, leading him to draw less and less. So the big red one retreated from the center of the action while Mignola brought the character’s team, the B.P.R.D., to the fore. He did this by assembling a supergroup of his own for a spinoff series, cowritten by John Arcudi (The Mask — yep, the Jim Carrey thing) and drawn by Guy Davis. With Hellboy off on his vision quest, it fell to his B.P.R.D. teammates to stave off the oncoming apocalypse. In 2005’s evocatively titled B.P.R.D. : The Black Flame, the team utterly failed to prevent a Nazi-obsessed corporate CEO in a World War II–vintage skeleton suit from awakening an entity called Katha-Hem, a revolting whale-slug-locust-squid hybrid-looking thing roughly the size of the New Jersey Palisades. Katha-Hem promptly obliterated Lincoln, Nebraska, and the B.P.R.D.’s years-old modus operandi of containment and cover-up was annihilated with it, ushering in a new status quo radically removed from the real world. Even as the story’s hope wound down, its scope widened. The concepts generated by the core quartet of Mignola, Arcudi, Davis, and colorist Dave Stewart spawned and sustained a superhero-style “shared universe,” supplementing the Hellboy and B.P.R.D. flagship titles with prequels, origin stories, and solo turns for major and minor characters alike. The artists involved ranged from stylishly cartoony to scratchily realist, though they all carried connotations of class within the genre that set them apart from the steroidal hyperkineticism of the superheroic mainstream. Unsurprisingly, this massive expansion made it impossible for the team to sustain uniform quality across the board, especially after Davis departed abruptly in 2011. (Long-standing industry rumor has it that the artist was the subject of a creative custody battle between Mignola and his Hellboy movie collaborator Del Toro, with the Pacific Rim director ultimately coming out on top; that film boasts Davis’s distinctive creature designs.) The sprawl also made keeping track of which story to read in what order something of a full-time job, a situation not helped by Dark Horse’s confusing array of collected editions. But nearly all of the “Mignolaverse” titles are shot through with a sense of tremendous loss, of mind-warping waste. The world Hellboy and his friends inhabit is a brutal one, rendered unspeakably ugly by a combination of venal people whose minds are too small for empathy and the unstoppable forces they therefore unleash. Moreover, there’s a specific sense throughout the saga that the violence wielded by its protagonists is futile, even counterproductive. 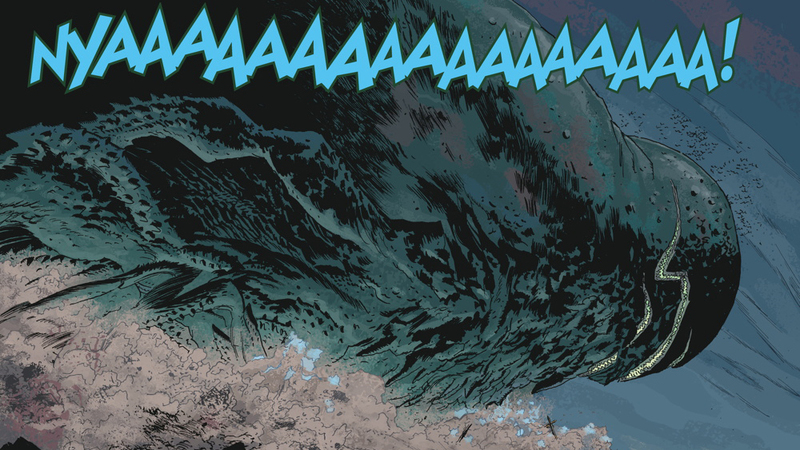 The most gung-ho member of the B.P.R.D., heavily scarred ex-Marine Captain Ben Daimio, secretly harbored an evil spirit that eventually took over and rampaged through the team’s headquarters. An attempt by the artificial man Roger the Homunculus to ape Daimio’s hard-charging attitude led directly to his own death. The depiction of violence as causing more problems than it solves is a self-critique that few superhero stories attempt, and even the ones that attempt it usually ultimately reject it. Yet Hellboy and the B.P.R.D. soldier on, fighting a menace they are too weak, and too late, to stop. Their goal, to the extent that they have one, is simply to survive, and to preserve what little light and life they can — to write an epilogue for a story that has already ended. J.R.R. Tolkien, the demiurge of fantastic fiction as we know it, coined a characteristically lovely and melancholy term for stories like this, in which good-hearted characters endure in a fight for a victory over evil they know they will never enjoy, even if they live to achieve it. “Together through the ages of the world,” says the elf-queen Galadriel in The Lord of the Rings, “we have fought the long defeat.” In this era of perpetual war, economic stratification, violent racial ressentiment, and environmental catastrophe, that’s a pretty familiar feeling. Hellboy has fought the long defeat for two decades and counting. His endless loss is the reader’s gain. Sean T. Collins (@theseantcollins) is a critic and comics writer who lives with his daughter on Long Island. I wouldn’t be surprised if the Marvel Cinematic Universe adopted this approach when age and exhaustion require it to start from scratch sometime in the 2020s.